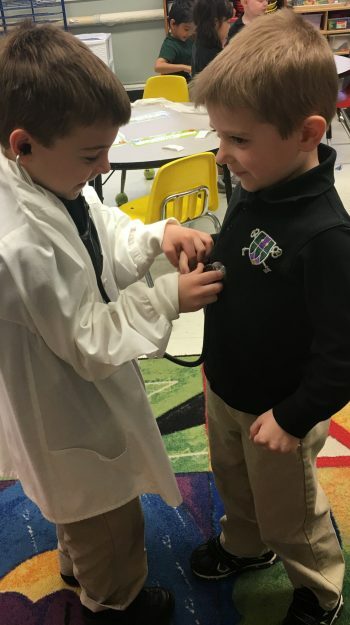 Pre-Kindergarten at St. Peter School is an early childhood education program that seeks to lay a solid educational foundation for children with a double focus on early spiritual development and kindergarten readiness. Classes composed of three and four year old children who are carefully prepared for kindergarten through simple instructional methods and concepts. Children are further introduced to a life of prayer and begin learning about the Mass each week. Our daily schedule features a variety of learning activities that is age level appropriate, entertaining, and nurturing. Religious instruction begins with instilling the concept of the Imago Dei (image of God) into the minds of the students, helping them to understand themselves in the image and likeness of God the Father, Our Creator. Students are introduced to basic Catholic prayers and traditions, such as the Rosary, and the Mass. Further, the students are introduced to the standard of the virtues and rewarded on a weekly basis with the rest of the school for excellence in the theological and human virtues. Classroom prayer and prayer celebrations that follow the Catholic liturgical year are a part of the curriculum as are many Bible stories and songs for the children’s enjoyment. Personal development includes knowing name and age, eventually learning address, phone number and birth dates, caring for one’s own physical needs, separating from parent with increasing ease and learning to respect oneself and others as well as the belongings of both. Social development includes cooperative play, sharing, following directions, and conversation skills with peers and adults, and respect for the legitimate authority of teachers and other adults. Language development at the early childhood level includes listening, speaking and thinking. Learning experiences that promote self-understanding help the child express thoughts and feelings in various ways. Visual discrimination and memory, and auditory discrimination and memory are important readiness skills that can be taught through play activities. Stories, songs, and poetry will enhance the love and use of good language skills. Play is a very necessary tool for the child’s learning process. Opportunities for play will occur as soon as the child enters the room and after structured learning activities. Outdoor play will be part of the daily schedule when weather is cooperative. Our Pre-K students also experience gym class on a weekly basis. Motor skills and gross motor skills are developed through large muscle activities such as running, walking, hopping and jumping. Throwing, catching, rhythm, and movement are also part of the organized play for the development of these skills. Fine motor skills include exercises in pasting, stringing, coloring, painting, pouring, lacing, scissors, etc. The use of Music is a channel for creative expression. Singing, listening to music, making use of rhythm instruments, dancing and other rhythmic activities all serve to develop a love and appreciation for music. Students are blessed to have music once, sometimes twice in a given week. Art usually encompasses one the following: the individual expression of the child, a pre- academic skill (following directions), a craft exercise or an exposure to artists and their works. Mathematics instruction includes exploration using concrete materials. Knowledge also comes from understanding of colors, shapes and quantitative concepts such as size differences, basic counting skills through practical application, classifying, forming sets and recognizing numerals. Workbooks and worksheets are inappropriate for math instruction at this level. Library time is also part of the weekly schedule for pre-kindergarten students. During library time, students learn the value of books, listen to stories, study pictures, and sometimes watch entertaining puppet shows! This class models the excitement of reading and important lessons. Get on your PJs and join us for a fun filled night of corny jokes and sweet times. There is not a moment to spare! The lanes are VIP reserved for our 6th to 8th graders.